Gerald Arthur Cooney (born August 4, 1956) is an American former professional boxer who competed from 1977 to 1990, and challenged twice for world heavyweight titles in 1982 and 1987. Born into a blue collar Irish-Catholic family on Long Island, Cooney was encouraged to become a professional fighter by his father. His brother Tommy Cooney was also a boxer, and reached the finals of the New York Golden Gloves Sub-Novice Heavyweight division. Cooney's grandparents lived in Placentia, Newfoundland. 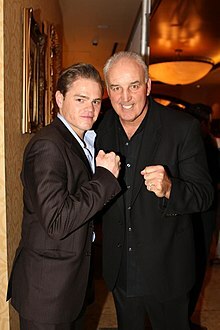 Fighting as an amateur, Gerry Cooney won international tournaments in England, Wales, and Scotland, as well as the New York Golden Gloves titles. He won two New York Golden Gloves Championships, the 1973 160-lb Sub-Novice Championship and the 1976 Heavyweight Open Championship. Cooney defeated Larry Derrick to win the 1973 160-lb Sub-Novice title, and Earlous Tripp to win the 1976 Heavyweight Open title. In 1975 he reached the finals of the 175-lb Open division, but was defeated by Johnny Davis. Cooney trained at the Huntington Athletic Club in Long Island, New York, where his trainer was John Capobianco. His amateur record consisted of 55 wins and 3 losses. When he turned professional, Cooney signed with co-managers Mike Jones and Dennis Rappaport. He was trained by Victor Valle. Known for his big left-hook and his imposing size, the tall, lean Cooney had his first paid fight on February 15, 1977, beating Billy Jackson by a knockout in one round. Nine wins followed and Cooney gained attention as a future contender, although his opponents were carefully chosen. He moved up a weight class and fought future world cruiserweight champion S.T. Gordon in Las Vegas, winning by a fourth round disqualification. Cooney had 11 more wins, spanning 1978 and 1979. Among those he defeated were Charlie Polite, former US heavyweight champion Eddie Lopez, and Tom Prater. These were not rated contenders, however. By 1980, Cooney was being featured on national television. Stepping up, he beat one-time title challengers Jimmy Young and Ron Lyle, both by 'knockouts.' The Young fight was stopped because of cuts sustained by Young. By then Cooney was ranked number 1 by the WBC and eager for a match with champion Larry Holmes. In 1981, he defeated former world heavyweight champion Ken Norton by a knockout just 54 seconds into the first round with a blisteringly powerful attack. This broke the record set in 1948 by Lee Savold for the quickest knockout in a main event in Madison Square Garden. Since his management team was unwilling to risk losing a big future pay day with Holmes by having him face another viable fighter, Cooney did not fight for 13 months after defeating Norton. The following year, Holmes agreed to fight him. With a purse of ten million dollars for the challenger, it was the richest fight in boxing history to that time. The promotion of the fight took on racial overtones that were exaggerated by the promoters, something Cooney did not agree with. He believed that skill, not race, should determine if a boxer was good. However, if Cooney won, he would have become the first Caucasian world heavyweight champion since Swede Ingemar Johansson defeated Floyd Patterson 23 years earlier. Don King called Cooney "The Great White Hope." The bout drew attention worldwide, and Larry Holmes vs. Gerry Cooney was one of the biggest closed-circuit/pay-per-view productions in history, broadcast to over 150 countries. Cooney fought bravely after he was knocked down briefly in the second round. He was fined three points for repeated low blows. After 12 rounds, the more skillful and experienced Holmes finally wore him down. In round 13, Cooney's trainer Victor Valle stepped into the ring to save his fighter from further punishment. Two of the three judges would have had Cooney ahead after the 12th round if it weren't for the point deductions. Holmes and Cooney became friends after the fight, a relationship that endured for them. After a long layoff, Cooney fought in September, 1984, beating Phillip Brown by a 4th-round knockout in Anchorage, Alaska. He fought once more that year and won, but personal problems kept him out of the ring. Cooney was far past his prime when he made an ill-advised comeback against former world heavyweight and world light heavyweight champion Michael Spinks. Boxing carefully, with constant sharp counters, Spinks knocked him out in round 5. Cooney's last fight was in 1990. He was knocked out in a match of the veterans in two slugging rounds by former world champion George Foreman. Cooney did stagger Foreman in the first round, but he was over-matched, and Foreman knocked him out two minutes into the second round. The losses to Holmes, Spinks, and Foreman exposed Cooney's Achilles' heel: his inability to clinch and tie up his opponent when hurt. In the Foreman fight, he rose from a second-round knockdown and stood in the center of the ring as Foreman delivered the coup de grâce. Cooney compiled a professional record of 28 wins and 3 losses, with 24 knockouts. Not a single one of his fights ever went the distance in a 12 or 15 round match. He is ranked number 53 on The Ring's list of "100 Greatest Punchers of All Time". Cooney, who is naturally left-handed, used an orthodox stance. This provided him with a powerful jab and a lethal left hook, but a comparatively weaker right, which he seldom used except in combinations. Most of his fights ended in quick knockouts; while this benefited him in the beginning of his career, it left him unprepared for his fight with Larry Holmes. Despite his devastating punching power, Cooney's moderate stamina and lack of experience proved to be his downfall. Cooney's left-hook is described as one of the most powerful punches in boxing history. Cooney was known for not throwing punches at the head, aiming instead for his opponent's chest, ribs, or stomach. This made him vulnerable at times, the fight against Holmes being an example. According to George Foreman, Gerry Cooney was one of the three hardest punchers he had faced in his career along with Ron Lyle and Cleveland Williams. Cooney founded the Fighters' Initiative for Support and Training, an organization which helps retired boxers find jobs. He did not encourage the racist tilt of promotion of the Holmes vs. Cooney match and became good friends with his former rival Holmes in the years afterward. Cooney is deeply involved in J.A.B., the first union for boxers. He became a boxing promoter for title bouts featuring Roberto Durán, Héctor Camacho, and George Foreman. Cooney is a supporter with of the "Hands are not for hitting" program, which tries to prevent domestic violence. He guides young fighters in the gym. Cooney resides in Fanwood, New Jersey, with his wife Jennifer and two of their three children, Jackson and Sarah. His son Chris resides in New York. Cooney has been inducted into the Hall of Fame at Walt Whitman High School, where he graduated. 31 Loss 28–3 George Foreman KO 2 (10), 1:57 Jan 15, 1990 Convention Hall, Atlantic City, New Jersey, U.S.
29 Win 28–1 Eddie Gregg KO 1 (10), 1:26 May 31, 1986 Cow Palace, San Francisco, California, U.S.
28 Win 27–1 George Chaplin TKO 2 (10), 2:50 Dec 8, 1984 Veterans Memorial Coliseum, Phoenix, Arizona, U.S.
27 Win 26–1 Philipp Brown TKO 4 (10), 2:37 Sep 29, 1984 Sullivan Arena, Anchorage, Alaska, U.S.
25 Win 25–0 Ken Norton TKO 1 (10), 0:54 May 11, 1981 Madison Square Garden, New York City, New York, U.S.
24 Win 24–0 Ron Lyle KO 1 (10), 2:49 Oct 24, 1980 Nassau Veterans Memorial Coliseum, Hempstead, New York, U.S.
23 Win 23–0 Jimmy Young TKO 4 (10), 3:00 May 25, 1980 Convention Hall, Atlantic City, New Jersey, U.S.
22 Win 22–0 Leroy Boone TKO 6 (10), 0:55 Dec 14, 1979 Convention Hall, Atlantic City, New Jersey, U.S.
21 Win 21–0 John Dino Denis TKO 3 (10), 1:14 Nov 9, 1979 Madison Square Garden, New York City, New York, U.S.
20 Win 20–0 Malik Dozier KO 6 (10) Oct 9, 1979 Long Island Arena, Commack, New York, U.S.
19 Win 19–0 Broderick Mason KO 4 (10), 1:44 Aug 22, 1979 Felt Forum, New York City, New York, U.S.
18 Win 18–0 Tom Prater TKO 2 (10), 2:13 Jun 29, 1979 Felt Forum, New York City, New York, U.S.
17 Win 17–0 Charlie Johnson KO 1 (10), 1:51 Feb 26, 1979 Felt Forum, New York City, New York, U.S.
16 Win 16–0 Eddie Lopez UD 8 Jan 13, 1979 Convention Center, Miami Beach, Florida, U.S.
15 Win 15–0 Grady Daniels RTD 5 (8) Dec 15, 1978 Felt Forum, New York City, New York, U.S.
14 Win 14–0 Sam McGill UD 8 Nov 1, 1978 Westchester County Center, White Plains, New York, U.S.
13 Win 13–0 Charley Polite KO 4 (8) Oct 4, 1978 Westchester County Center, White Plains, New York, U.S.
12 Win 12–0 G. G. Maldonado TKO 8 (8), 2:56 Jun 22, 1978 Madison Square Garden, New York City, New York, U.S.
10 Win 10–0 Gary Bates KO 4 (6) Feb 11, 1978 Las Vegas Hilton, Winchester, Nevada, U.S.
9 Win 9–0 Austin Johnson KO 1 (6), 1:23 Jan 27, 1978 Calderone Concert Hall, Hempstead, New York, U.S.
8 Win 8–0 Terry Lee Kidd KO 1 (6) Jan 14, 1978 Colonie Hill, Hauppauge, New York, U.S.
7 Win 7–0 Jimmie Sykes KO 1 (6) Dec 21, 1977 Roll-O Rama, New York City, New York, U.S.
6 Win 6–0 Quinnie Locklear KO 1 (6), 1:51 Nov 30, 1977 Westchester County Center, White Plains, New York, U.S.
5 Win 5–0 Joe Maye KO 4 (6), 2:15 Nov 18, 1977 Madison Square Garden, New York City, New York, U.S.
4 Win 4–0 Matt Robinson PTS 4 Aug 3, 1977 Madison Square Garden, New York City, New York, U.S.
3 Win 3–0 Jose Rosario KO 2 (6), 2:10 Mar 20, 1977 Exposition Center, Louisville, Kentucky, U.S.
2 Win 2–0 Jimmy Robertson KO 2 (6), 1:58 Mar 2, 1977 Madison Square Garden, New York City, New York, U.S.
1 Win 1–0 Bill Jackson KO 1 (6), 1:32 Feb 15, 1977 Sunnyside Garden Arena, New York City, New York, U.S. In an episode of The Simpsons, "$pringfield", Cooney is the official greeter of Mr. Burns' Casino, but gets dropped by a single punch by an irritated Otto Mann. Cooney performed in the 1998 film Mob Queen as Mickey the Baker. He is mentioned in the film The Great White Hype. He is mentioned in the song "Inner Light," by hip hop duo Zion I. He is featured in the song "Cooney Vs. Munly" on Jay Munly's 2002 album Jimmy Carter Syndrome. Jim Carrey, playing fictional character "Gerry Cooney Jr.," appears on a sketch in season 2, episode 11 of In Living Color. In the season 5, 100th episode of 30 Rock, Dennis Duffy says he went to "Gerry Cooney Elementary School". In an episode of Married... with Children, "Reverend Al", character Al Bundy proclaims that women could "no longer whip us (men) like a nation of Gerry Cooneys!" Cooney guest-starred as "Angel" in episode 17 of season 1 of Spenser: For Hire, "In a Safe Place". Angel acts an enforcer who outboxes Spenser, but quits rather than hurt him. In the Saturday Night Live sketch "The Dark Side," Cooney (played by Kevin Nealon) is portrayed as a weak boxer, costing whites money who had bet on him to win in fights against African-American boxers. ^ "Cooney Has Bright New Visions Says Bad times Behind Him as He Gears up to Fight Spinks". The Washington Post. Fred Ryan. Retrieved March 23, 2018. ^ Gerry Cooney (1956-08-04). "Gerry Cooney Quotes". BrainyQuote.com. Retrieved 2016-10-02. ^ Wadden, Marie. "Gerry Cooney and his tough family legacy in Placentia". CBC News. CBC News. Retrieved 28 April 2017. ^ "Larry Holmes Vs Gerry Cooney: VHS Classic Rewind | Boxing 101 | Sports Media 101". Worldboxing101.com. Retrieved 2016-10-02. ^ Holmes, Larry (1998). Against the odds. St. Martin's Press. ISBN 9780312187361. ^ "George Foreman On Tyson & Hardest Punchers". YouTube. 2011-11-02. Retrieved 2016-10-02. ^ "Larry Holmes and Gerry Cooney: Foes for a Night, Friends for a Lifetime | Boxing 101 | Sports Media 101". Worldboxing101.com. Retrieved 2016-10-02. This page was last edited on 15 April 2019, at 14:32 (UTC).